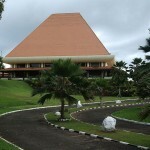 Fiji Parliament House. Photo courtesy of Jarred Wilshire, 2006 via Wikimedia Commons. The move from authoritarian to freely elected rule is a dynamic moment. It should be seen as a window of opportunity but also one of significant risk. The Fijian political transition scheduled for mid 2014 should be considered in this light. Transitions from below, or bottom-up transitions, are collectively organized mass mobilizations against the regime in power. Taken to the extreme, they can result in regime collapse or downfall. The ultimate expressions of these are social revolutions involving mass collective violence such as the Bolshevik Revolution of 1917, the Chinese Revolution of 1948, the Cuban Revolution of 1959, and the Iranian and Nicaraguan Revolutions of 1979. The so-called Arab Spring provides other examples of bottom-up transitions, although like the revolutions just mentioned they do not necessarily end up in democracy. In fact, bottom-up transitions are more likely to see the replacement of one authoritarian regime by another rather than a democratic outcome. They can also result in a partial restoration of the old regime under new leadership. Tunisia, Libya, Egypt and Syria are examples in both regards. Transitions from above, or top-down transitions, are those where the outgoing authoritarian regime controls the timing, pace and conditions governing a move towards elected rule. Usually such transitions are undertaken by regimes that are relatively stable and effective in government, who seek to return political authority to elected officials as a form of political legitimation under controlled circumstances. This is especially true for military-led regimes, where long-term tenure of officers in power is seen as inimical to the core war-fighting mission of the armed forces. Given its strength as government and its popular support, in top-down transition scenarios the authoritarian regime can dictate terms governing the political transition to elected rule, to which opposition parties must agree for the transition to occur. In spite of the constraints placed on what the opposition can do, this form of regime change is considered to be the most likely to lead to democracy even if the initial post-election period is characterized by on-going authoritarian influence on elected government (known as the immediate authoritarian legacy). During the last forty years this form of regime change has been seen in Argentina, Brazil, Chile, El Salvador, Guatemala, Indonesia, Peru, South Korea, Spain, Turkey and Uruguay, among other countries. In bottom up transitions authoritarians operate from a position of weakness. In top down transitions they operate from a position of strength. Bottom up transitions often are rapid, abrupt and violent; top down transitions can be prolonged and protracted. Fiji is in the process of undergoing a top down transition to elected rule after nearly 8 years of military-bureaucratic authoritarianism. Elections are scheduled for September 2014 and the regime of Commodore Voreque “Frank” Baimimarama has drawn up a new constitution, timetable and conditions under which those elections will be held. The objective, as 36th Parallel Assessments has noted previously, is to establish a “guarded” democracy as the first post-authoritarian regime (https://36th-parallel.com/2013/01/17/futures-forecast-a-guarded-democracy-in-fiji/). The prospects for a long-term move to full democracy will depend on the success of the first post-authoritarian governments and their acceptance by the Fijian population as well as the armed forces. Opponents of the Baimimarama regime complain that the election process is rigged and that their freedom of expression and movement are prohibitively curtailed, thereby leading to a pre-determined outcome in which the Commodore will win the elections while retaining his position as commander of the Fijian Defense Force. Whether he does so or not, the Fijian Defense Force will act as guarantors of the new constitution and arbiters of what the early post-authoritarian governments can do in office. Supporters of the regime claim that some leadership continuity is necessary to prevent a fall back to the corruption and excesses of previous elected governments. They maintain that even with some limitations on what political parties can do and military veto power over government policy-making, the post-authoritarian regime is a vast improvement over previous instances of elected rule and a step forward in the development of Fijian democracy. They argue that much like children learning to walk before running, the Fijian population needs to learn their responsibilities as well as their rights under democratic governance, which is why military tutelage has been necessary over the short term. Each side is partially correct. The transition process is controlled by the Fijian military and it will serve as non-elected government overseer after the elections are held. But the opposition is not entirely without leverage or means of pressing its cause for a fuller restoration of civilian authority. That is because the process of top down transition involves the interplay between opposition and regime in which, within the general framework governing the election campaign and constitutional conditions underpinning the successor regime, specific parameters of action and modes of behavior can be negotiated between political actors on key issues. The de facto interaction between regime and opposition forces is as important as it’s de jure guidelines. Who engages and how they engage is not a simple function of the legal framework governing the campaign and the elections or the fact that the dictatorship ultimately has armed force at its disposal. Instead, the transition process is more akin to a “two steps forward, one step back” affair in which the opposition tests the limits of what is allowed by the regime’s guidelines for the transition and the regime responds by withdrawing certain privileges or freedoms as a caution against pushing too far. The ebb and flow of this delicate political dance constitutes the transition progression, something that may or may not lead to a democratic outcome. For that to occur both sides need to exercise caution. The regime runs the risk of over-reacting to reasonable opposition advances with repressive sanctions and in doing so de-legitimizes the entire transition process. An authoritarian regression may be acceptable to core regime supporters (many of whom do not want to see an electoral transition) but is not a long-term solution to the problem of legitimate, mass-based governance. The opposition runs the risk of pushing too far beyond acceptable expectations of what is and is not possible given the popularity of the authoritarian elite in the eyes of key supporters, foreign and domestic. If the opposition behaves in a way that allows them to be characterized as unreasonable or extremist, then the chances of an authoritarian regression, to include cancellation of elections and a repressive crackdown, are much higher. Consequently, there are self-limiting strategies built into the de facto transition process because these are the ones most likely to meet mutual expectations and achieve real progress towards legitimate elections. 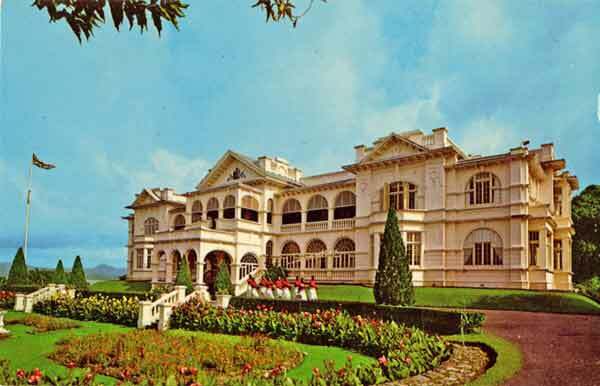 Government House, Suva. Photo courtesy of Wikipaedia. 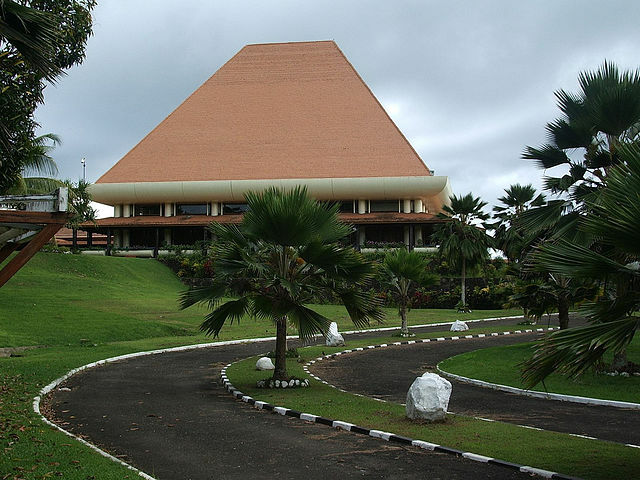 The arrest of 14 peaceful demonstrators outside Government House in Suva on September 6, 2013 illustrates the issue. The demonstrators were protesting adoption of the 2013 Constitution by presidential assent. They were doing so without a permit, which is required for public gatherings under the January 2012 Public Order Amendment Decree. Those arrested, which included members of the trade union movement and former Prime Minister Mahendra Chaudhry, were questioned, cautioned and released after 14 hours in custody. Both sides exercised self-restraint in the incident. The protestors stood silently and brandished placards opposing the 2013 constitution. The police moved in and carried out the arrests without incident, and treated those detained with civility. In doing so both sides made their respective points. There will be more such interplay in the months ahead. The pace and intensity of the interplay between government and opposition can be expected to increase in the build up to election day and in the immediate aftermath of the results being made public. The way in which the process unfolds will be critical to the ultimate outcome, be it the holding of successful elections, another postponement, or annulment of the results. The key to a successful transition to elected government and the eventual restoration of full democracy is for moderates on each side (regime supporters and regime opposition) to dominate the interaction between regime and opposition in the lead-up to the voting date. But that is not a given, since both sides can roughly be divided into hard liners and soft liners. The hard liners in the Baimimarama regime are its core adherents who do not wish to see a transition. They are members of the military and civilian bureaucracy whose personal and professional fortunes rest on the continuation of authoritarian rule (including grants of legal immunity for their actions during the authoritarian era). That could include Commodore Baimimarama himself, who may see elections as a way of cloaking the prolongation of his rule in a mantle of popular legitimacy. Hardliners in the opposition are those who have been directly affected by the regime’s repression and political exclusion. They include political party and church leaders, unionists and tribal elites who were the focus of military-bureaucratic sanctions. These individuals and groups want to see Commodore Baimimarama and other authoritarian leaders face trial for alleged crimes committed under their rule. The soft-liners who support the authoritarian regime applaud what it has done in office but feel the time has come for power to be shared with broader elements in Fijian society. These include business elites, civil servants, diplomats and selected interest groups. They do not feel as personally or professionally vulnerable to a change of regime. The soft-liners in the opposition are those who have not been directly affected by repression and who see the need to exercise caution when approaching the subject of post-authoritarian justice. They have less of a personal stake in retribution or punitive sanction of Baimimarama and his cohort and more interest in moving incremntally forward towards fuller restoration of civil liberties and political rights. Foreign actors also have different perspectives on the transition. Many international organizations, private entities and foreign governments want a full restoration of democracy at the earliest possible opportunity. Others are indifferent when it comes to the transition and prefer the stability offered under current conditions than the uncertainty of a return to the politics of yore. For the latter concerns about their stake in Fiji in the event of regime change outweigh concerns about the current nature of it. These actors are more prone to accept the continuity argument of regime hardliners, whereas the former are more likely to subscribe to the views of opposition hardliners that a full immediate break with the Baimimarama era is required. Here again, they key to a successful transition to mass-based elected rule is for the foreign interlocutors to align their views with the moderates on both sides of the Fijian political divide. That will require the negotiation of post-election guarantees amongst them. Strategically speaking, for the Fijian transition to lead to the restoration of legitimately elected popular government, soft-liners on both sides will need to negotiate political compromises on core policy and legal issues while marginalizing their respective hardliners. They will need to initiate these conversations prior to the election date and honor whatever promises made after it. The hardliners will not, by virtue of their positions, speak to each other. But they could dominate the internal discussions within each camp. Consequently, the first order of business for those who wish to see a genuine transition to accountable elected rule is to sideline the extremists/militants/hardline elements within their respective camps. The biggest problem in doing resides in not giving the appearance of selling out to the other side, which will be the first claim made by hardliners within and against the Baimimarama regime. They key to succeeding in this task is to separate the individual fortunes of individuals from those of institutions and agencies charged with running the country in the future. Should soft-liners or moderates be successful in dominating the approach to the transition on each side of the Fijian political divide, then the issue of mutual guarantees and political compromises can be broached. The political compromises required to ensure that the transition to elected rule happens on time and as scheduled can be divided into procedural and substantive in nature. The former involve the terms and conditions under which the elections are held and results accepted by all parties. These start with the regime’s proposed timetable and rules for participation, and end with an agreement to accept the results as binding. The path from one to the other is not written in stone and will be the first order of business for all interested in participating. If procedural compromises can be agreed upon, then substantive compromises can be negotiated about issues of post-authoritarian policy. This will include the extent, if any, of prosecutions for misdeeds committed during the authoritarian era as well as the compensation offered for those victimized by it (and the trade-offs they may entail). They will include discussion of core economic and investment issues (including the issue of guarantees for investors and agents favored by the dictatorship) as well as foreign policy and post-authoritarian civil-military relations. There are other substantive issues likely to be tabled but these will be the core sticking points for the post-authoritarian political system. The outcome of the Fijian political transition scheduled for 2014 is uncertain at the moment. 36th Parallel Assessments is positioned to offer forecasts and targeted advice on the transition process, including analysis of the procedural and substantive terms and individuals and entities involved in it. These services will be of particular value to potential stakeholders, be they institutions, investors or other interlocutors.